THE partner of Pauline Hunt has told how he secretly planned the couple’s heartbreaking wedding after her devastating diagnosis. 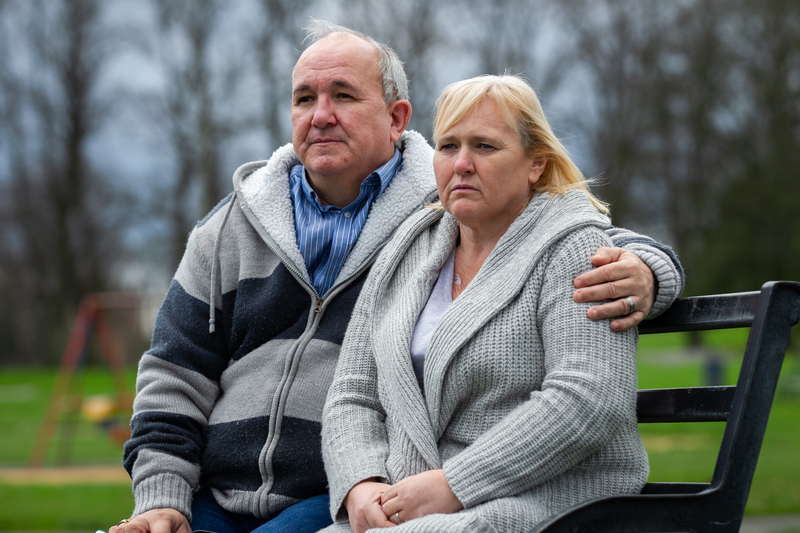 Devoted Gordon fought back tears to comfort Pauline when doctors revealed the kidney transplant that was supposed to save her life was killing her instead. He said: “I had to be strong for my Pauline because I could see how frightened she was when the specialists told her the transplant had given her cancer. “Nobody could tell us how long she has, so I resolved to give her the best possible memories. I wanted her to know just how much I loved her. “We had planned to get married next May, but after the diagnosis, I decided we had to bring the wedding forward. “I set about planning the most special day I could for her. 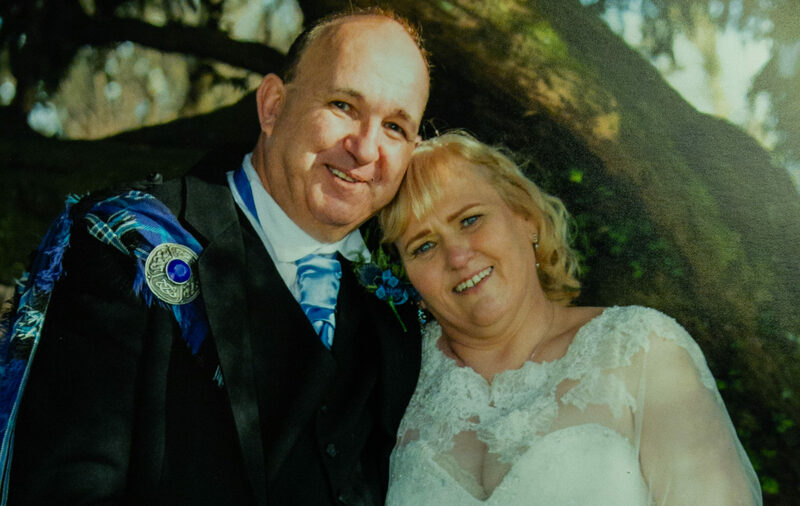 Gordon, a former warehouseman, began searching for a bridal gown fit to grace the love of his life. He said: “Pauline and had I met online almost three years ago, and from the moment I laid eyes on her, I knew she was the one I had been waiting for. Within weeks, they were a couple and during a holiday to Benidorm, Gordon tricked Pauline to go up on stage in front of hundreds of people, so he could go down on one knee to propose. Gordon said: “I’d bought a beautiful engagement ring and we invited our kids and my sister to go on holiday with us. “They were all in on the secret. Only Pauline didn’t have a clue about my proposal plans. “We’d been for a lovely meal and were settling down to watch the nightly show in the hotel when Pauline got called to the stage. The couple planned their lives together unaware of the life-and-death struggle that lay ahead. Gordon said: “We had planned to get married next year, so we hadn’t done all the saving we’d planned. “But that didn’t stop me. I wanted my girl to have the best day of her life. “I found a beautiful wedding dress online, and I managed to get it for £60. I just knew it would be beautiful on Pauline and I was right. She looked like a princess when she put it on. “I applied for a special licence to get married at the Queen Elizabeth hospital because we didn’t know how much time we had left together. “The hospital chaplain was wonderful and agreed to marry us. “Friends and family gathered round and together we managed to get stunning flowers, a wedding cake, kilt outfits and bridesmaids dresses. We even got a hotel booked for a reception. “When people heard what had happened to Pauline, they were so kind and offered their services either free or at cost. The couple married in the hospital in March, and when Gordon slipped the diamond-encrusted wedding band he had chosen onto Pauline’s finger, there wasn’t a dry eye in the room. 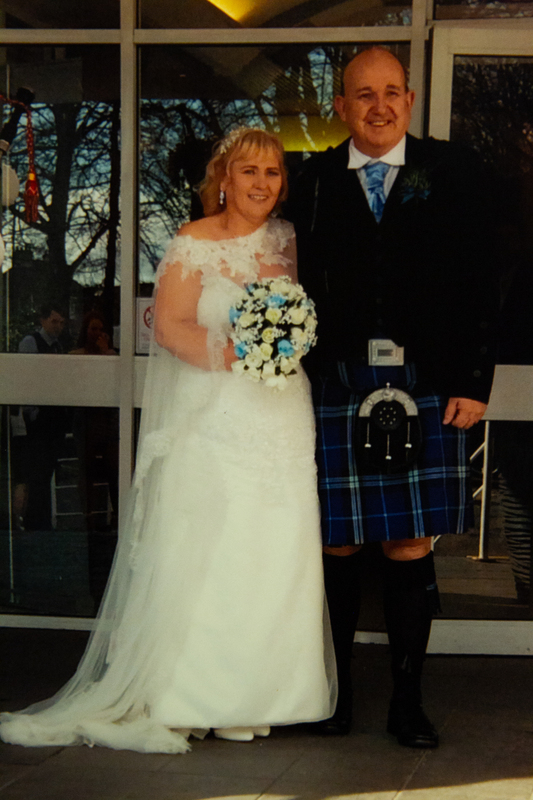 Pauline and Gordon refused to let cancer spoil their wedding day. The happy couple, who have four grown-up children, threw a reception for more than a hundred guests at a hotel near the hospital. Pauline said: “It really was everything I would have wanted if I’d been able to plan it all myself. “In truth, our wedding day was made even more special than I could ever have imagined because everyone had done their bit to make it a happy occasion. “My dad made a very proud speech, so did Gordon and his son Darren. When we got up for our first dance, everyone cheered. “We were surrounded by love and happiness, and somehow that kept the tears mostly at bay. “I was determined to fight though the pain and tiredness to be there to say goodbye to all my guests. “It really was the most wonderful day,” she added. Gordon says he will never forgive the NHS and transplant service for what happened to Pauline. He said: “She is such a wonderful lady, the thought of losing her makes me sick and beyond angry. The big bear of a man has to wipe back a tear as he thinks about the nightmare that lies ahead. He said: “There are nights when I lie awake and blame myself. “On the day of the transplant Pauline told me she had a horrible feeling about the operation. “She said she had this feeling of doom and it was so bad, she tried to pack her bag and go home. “I can’t get it out of my head that I persuaded her to stay and have the operation. “There were three kidneys available that day. One of them was scarred, so they didn’t use it. “It was a 50/50 chance that Pauline got the kidney that would put her in her deathbed. “I wish I’d listened to her fears that day instead of assuring her she was just suffering nerves. In a voice breaking with emotion, he said: “Each day is special to us now because we don’t know how long Pauline has. “I try and make her smile, because Pauline has the most beautiful smile it, lights up the room. “But I see the sadness and fear in her eyes. “It tears me apart that there’s nothing I can do to take that pain away from her. “The devastation doesn’t just affect us. Our families are heartbroken too. “The day I had to gather them together to tell them Pauline had developed cancer from the kidney transplant was the worst. For now, life is a continuous round of hospitals and specialists. Pauline said: “There’s no break from it. “There’s hardly a day goes by when I’m not attached to a dialysis machine or going for tests. “Gordon is always at my side. “We are so grateful we found each other when we did. Organs being prepared for transplant are subjected to a rigorous screening but the process is not infallible, according to experts. Dr Michael Porter said the donor’s medical records and any relevant scans are reviewed and the organ itself is examined for any signs of a tumour. Dr Porter, of Central Lancashire University, said that even when a tumour is spotted, some cancers are deemed safe enough for transplant. “All relevant medical records and any scans are reviewed, but the organs are also screened for visible tumours. “If doctors can see a tumour, small parts of it can be examined under a microscope to spot if it is aggressive and likely to spread. “Anyone who has a brain, lung, blood, bowel or melanoma would usually be automatically excluded, except in rare and extreme circumstances. “Tumours are very common, but thankfully they’re normally benign. “However, for all donors deemed safe to donate, there is a 0.06% chance of the recipient developing cancer. So what are the chances of getting cancer from a transplant? A UK study looked at 15,000 donors who gave to 31,000 recipients and 18 of those patients developed cancer. Those patients who get organs are fighting cancer on two fronts. They have a small risk from the donor organ and another from having their body’s own natural defence system – the immune system – turned down by drugs to allow them to accept a transplant. Transplant patients being infected with cancer by their new organs is extremely rare, according to official figures. Just 15 of 30 ,765 UK transplant recipients developed donor-transmitted cancers between 2001 and 2010. Three died. There has been only one case similar to the plight of Pauline Hunt and the unnamed English patient, who died, reported in recent years. In 2007, a US medical journal told how three women died from breast cancer after transplants from the same 53-year-old donor, who died of a stroke, with DNA proving her cancer was passed on. In Scotland 569 people with life-threatening illnesses were waiting for an organ transplant in September, according to recent figures. 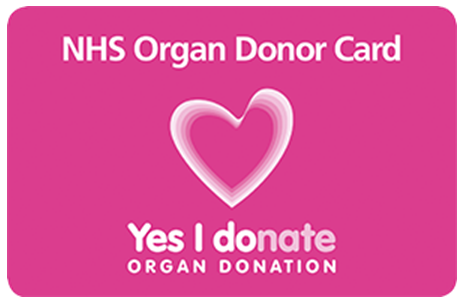 The number of patients in Scotland whose lives were saved or improved by an organ transplant reached a record high in April last year. And a planned new system will mean Scots are assumed to have agreed to donate organs unless they opt-out. The plight of patients given organs infected with cancer is revealed days after compensation was agreed for victims of an infected blood scandal. The Scottish Government announced on Friday annual payments of up to £19,000 for 190 people who contracted hepatitis C from contaminated NHS products. Those worst affected will receive £18,900, with £6,300 for those moderately affected. Anyone for whom the disease does not have a noticeable day-to-day impact will receive £1,000.